“Come on, Jack! You can do this!” Joe called as Jack tiptoed to the edge of the platform. 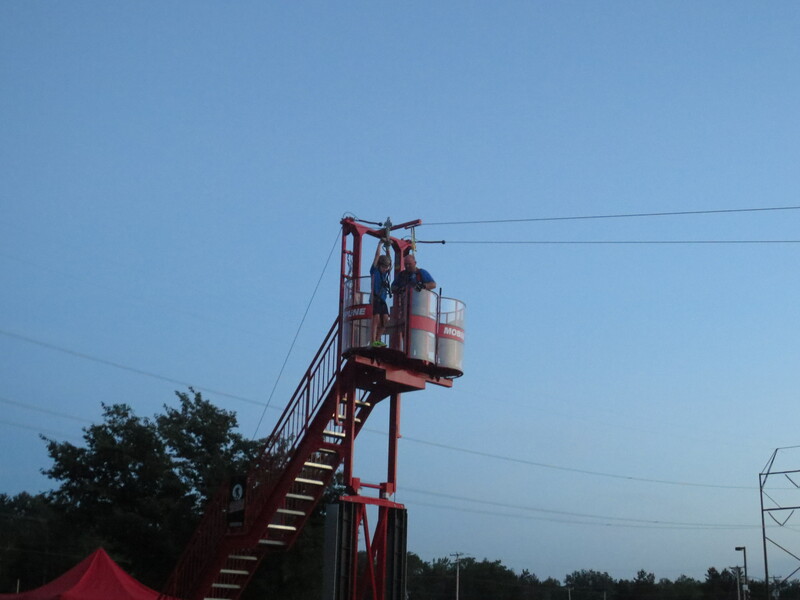 We were at the annual Fourth of July fireworks carnival in a neighboring town, and this year they were offering zip line rides. The three older boys were delighted to try it, and they’d decided the order amongst themselves: Jack first, then Charlie, Joey last. Unfortunately, the line moved slowly and they were the last to get suited up and climb the stairs. Jack came out on the platform just as the sun was beginning to set. We stood below, and when I looked up I knew, knew this wasn’t going to go well. He stepped forward, then back again, forward and back. From the ground I could hear his high-pitched whine, the attendant’s gentle encouragement. After about ten minutes, the fireworks show started and they had to pack up the zip line and close the ride. Jack turned and made his way back down the stairs. Joe led them over to our blanket to watch the bursts of color peppering the sky, but Jack would not sit. He kept his arms clasped around my waist and leaned on me, weeping and chanting, “I could not be brave, I could not be brave.” We stood in the back, on the edge of the grass, swaying and rocking together. Two days later Joe and I decided to try again, to give Jack another chance and let the other kids have a turn hurtling through the air on a steel wire. 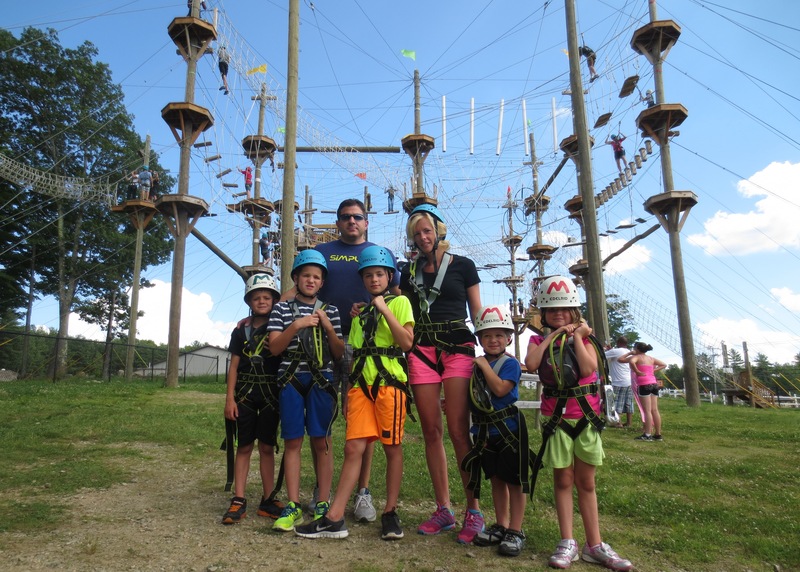 We found a zip line place about an hour from us, called Monkey Trunks, Extreme Aerial Adventure Park for All Ages. I know, right? Why wouldn’t that be on our list of things to do this summer? See, here’s the thing. I like happy endings, and I think everyone—especially kids—deserve more than one opportunity to try, to be brave. I believe in second chances. 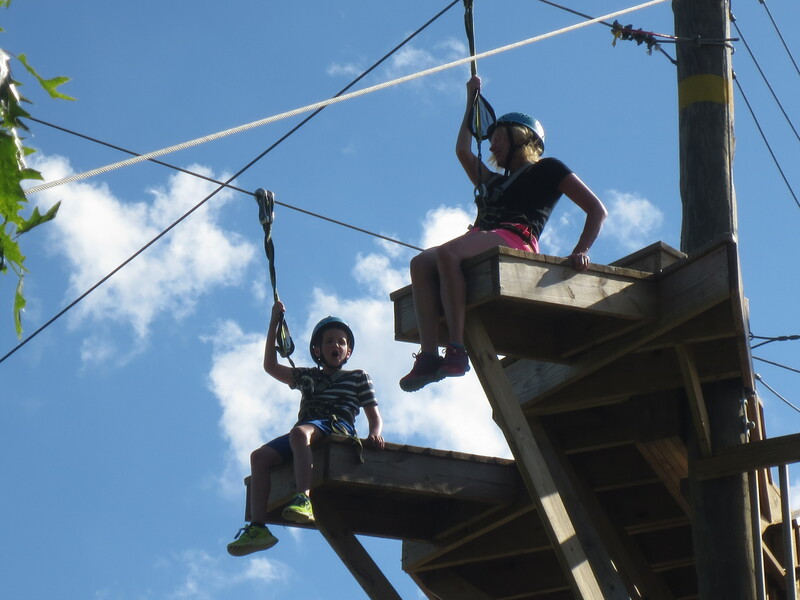 Once at Monkey Trunks, we all suited up in harnesses and they gave us a quick overview on how to navigate the course and work the latches—called monkey paws—while we dangled in mid-air. In an unusual division of parental labor, Joe decided to stay on the ground and help the three younger ones, while stupidly I agreed to head up with Joey and Jack to the adult course. A course that included not only zip lines, but bridges held up with ropes, cargo nets, and teeny wobbly platforms you had to step across with your new pink Crossfit sneakers. While the twenty-something guy named Kyle told us how one monkey paw would not open unless the other one was closed, how you should never attach to the wires marked with red tape, only green, Jack peppered him with questions. Good grief, I thought to myself. What have we gotten ourselves into? I started to sweat, and it had nothing to do with the 90-degree temperature or the blazing hot afternoon sun. I asked Kyle if he could slow down, go over the directions once again, but before he opened his mouth Joey and Jack had zipped down the test line and bounded up the stairs to the course. I raced up behind them and burst out onto the first platform. Joey was already two obstacles ahead of me, but Jack was struggling to clip one of his monkey paws. His face looked panicked. Slowly, he reached out a foot to stand on the bridge suspended by two ropes. Slowly, I followed him, my heart beating fast. I, on the other hand, was not feeling brave. I was terrified. I know I’ve written about fear before, about being afraid Jack will have to live with us forever, won’t have a normal life, blah, blah, blah. Well, let me tell you, that fear is nothing compared to the terror of watching the same nine-year old boy fumble and slip and cry on an extreme aerial obstacle course. Add a little sky-high stimming to that, and you’ve got yourself a real adventure. “What’s the quickest way off of this thing?” I gasped to the girl standing before the next obstacle, sweat dripping down my face. I licked my lips and realized I had a splinter right above my mouth from hugging the wooden poles so tightly. Tight rope? Vertical net? FLY? I thought to myself. Splayed like Spiderman in fluorescent shorts, I gingerly put one foot into the vertical net and slid the other one over. “Mom! You are doing it!” Jack screamed from his perch on the other side. At last we were at the tower. Blessedly, we walked up the stairs to the final zip line. There were two lines next to each other, designed so people could race each other down. We inched our way out on this final platform and sat down. I looked over at Jack, and his furrowed brow showed a tenacity, a fierceness, a powerful determination I have never seen before. Sweating and trembling beneath the blue July sky, I saw the two warriors of his autism—anxiety and rigidity—circle and growl and battle each other. And I wondered who would emerge the victor and who would surrender; the no no I can’t do this I am afraid it is scary or the I will do this I said I would I will I will of my little boy’s soul. I closed my eyes and slid down. When I opened my eyes at the end of the line, I looked to my right just in time to see Jack glide next to me. Shakily, I stood and helped him unlatch his monkey paws. “I will never be afraid again,” he told me, as he bounced out of the field with his harness trailing after him. Jack and I on the final zip line. Excellent! Congrats to everyone on their bravery. Second chances, yes! WOW how courageous of both of you. That was a huge TAH DAH. Way to go !!!! A girl in hot pink shorts can accomplish anything! And so can your boy. Well done, Brave Family!